Huntsville, AL – The arts mean business in Huntsville/Madison County! The nonprofit arts and culture industry in Huntsville/Madison County generates $89.9 million in annual economic activity, supporting 3,073 full-time equivalent jobs and generating $6.6 million in local and state government revenues. This is according to the Arts & Economic Prosperity 5 national economic impact study, the most comprehensive economic impact study of the nonprofit arts and culture industry ever conducted in the United States. The study was conducted by Americans for the Arts, the nation’s leading nonprofit organization for advancing the arts and arts education. Results show that local nonprofit arts and culture organizations spent $53.8 million during fiscal year 2015. This spending is far-reaching: organizations pay employees, purchase supplies, contract for services and acquire assets within their community. Those dollars, in turn, generated $53.5 million in household income for local residents and $6.6 million in local and state government revenues. Nationwide, the Arts & Economic Prosperity 5 reveals that the nonprofit arts industry produces $166.3 billion in economic activity every year, resulting in $27.5 billion in federal, state and local tax revenues (a yield well beyond their collective $5 billion in arts allocations). In addition, it supports 4.6 million full-time equivalent jobs. “This study demonstrates that the arts are an economic and employment powerhouse both locally and across the nation. A vibrant arts and culture industry helps local businesses thrive and helps local communities become stronger and healthier places to live. Leaders who care about community and economic vitality can feel good about choosing to invest in the arts. Nationally as well as locally, the arts mean business.” – Robert L. Lynch, president and CEO of Americans for the Arts. 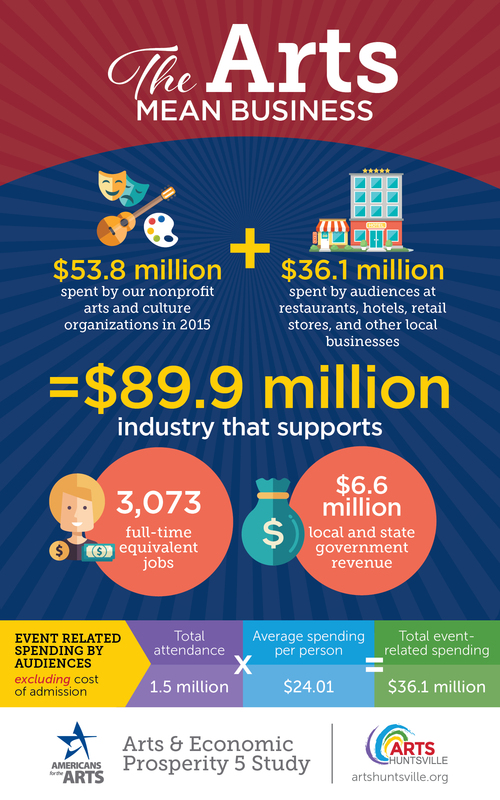 In addition to spending by organizations, the nonprofit arts and culture industry leverages $36.1 million in event-related spending by its audiences. As a result of attending a cultural event, attendees often eat dinner in local restaurants, pay for parking, buy gifts and souvenirs, and pay a babysitter. What’s more, attendees from out of town often stay overnight in a local hotel. “A strong and vibrant arts community is essential to ensuring our continued success and growth in Huntsville. As we look to attract companies and individuals to our area one of the first things they look for is quality of life and more specifically our commitment to the arts. I’m proud of the work that Arts Huntsville continues to do to make sure we provide a full landscape of arts and cultural experiences to our citizens.” – Ron Poteat, Huntsville/Madison County Chamber of Commerce Foundation Chair and North Alabama area president of Regions Bank.